"Courageous, proud and daring, the Poles are like the eagle that has served as their national emblem since the twelfth century. They have preserved their culture and national identity against the nearly insurmountable odds of debilitating alien rule, devastating major wars and the surrender of their lands for 150 years to foreign powers. The Poles' intense pride in their culture is more than justifiable considering the broad spectrum of human endeavor they have enriched through their contributions." 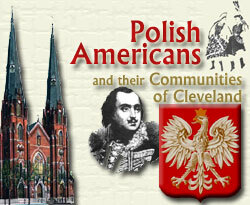 This 3-part monograph by four different authors covers Polish history and culture, immigration to America, and the Polish community of Cleveland. This edition contains the complete text as found in the 1976 print edition from the Cleveland Ethnic Heritage Studies series by Cleveland State University, along with some enhancements developed to aid in navigating this site.